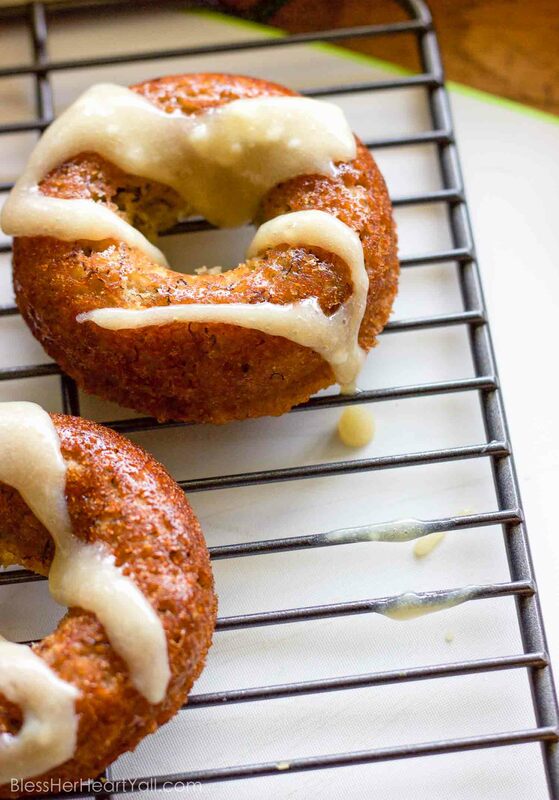 These gluten-free banana bread donuts are a great reason to wake up in the morning! 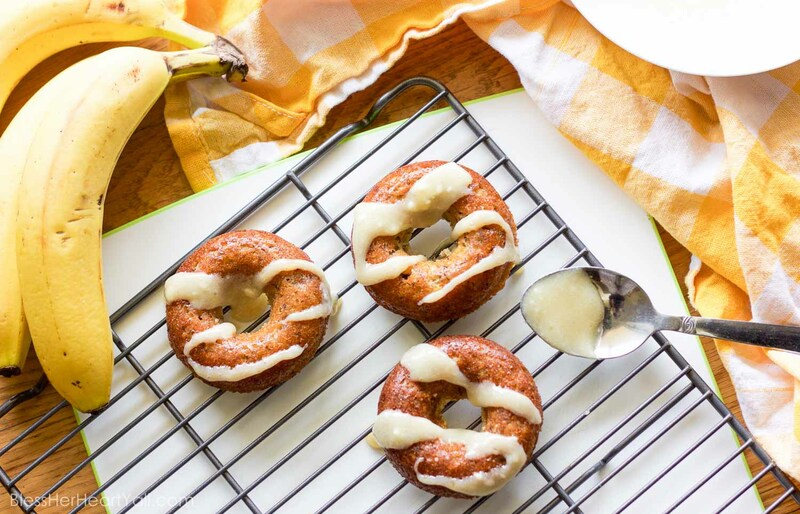 Soft and moist banana bread is baked into fluffy donuts and then drizzled with an easy and quick honey cream cheese drizzle. Happy Monday y’all! I hope everyone had a great weekend. I had a girls weekend with my mom at my place and we did some major demo work and painting in the farm house (more on that in a later post!). We also did some recipe creating. Mom came with an idea on how to make jalapeno poppers even more amazing (coming very soon to a blog near you!) 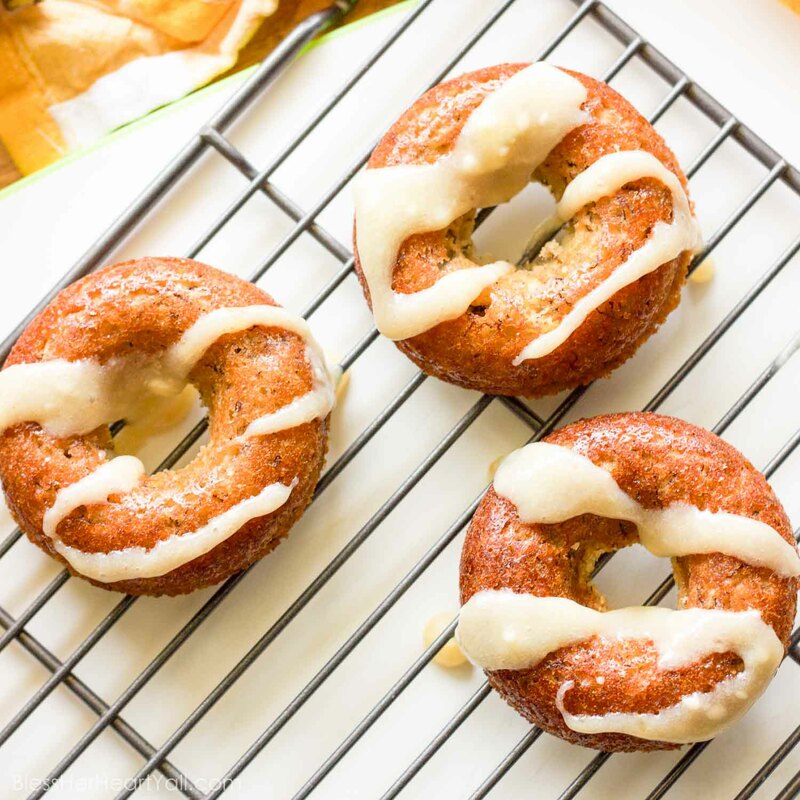 and I decided to tweak my old college roomie’s banana bread recipe into a gluten-free banana bread donut version with a very out-of-the-blue honey cream cheese drizzle idea. Both ideas turned out amazing, so that means that the weekend was a busy success. I made these gluten-free banana bread donuts on Sunday morning for breakfast and we stuffed as many as we could down. Then for lunch and dinner (and who am I kidding, and for a snack) we cashed in the rest of these simple breakfast rings. The combination of flours used along with the banana make it a fluffy and moist donut, surrounded by sweet cream cheese drizzle mixed with warm honey for a perfectly-not-too-sweet topping that complements this breakfast twist with finger-licking precision. These are easily made before church or school, but if you need a good reason to wake up on a monday morning, make these donuts ahead of time the night before. They stay great overnight in an airtight container or zippie bag. Just drizzle the honey cream cheese icing on just before devouring. For shizzle. Preheat your oven to 350*F. Place your mini loaf tins on a baking sheet and set aside. Combine the flours, granulated sugar, baking soda, baking powder, salt, eggs, water, butter, and bananas in a large mixing bowl. Allow to sit for 5 minutes. Add the batter to the mini loaf cups, filling each 2/3 full. Bake for 21-23 minutes (it's 21 minutes in my oven) or until the edges of the loaves turn a nice golden brown. Remove from oven and allow to cool on a cooling rack. Enjoy! I am going to save this recipe and give it a try. Thanks for sharing. I’m glad that you found the recipe! It’s my Mom’s favorite breakfast at my house! I hope that you like them as much as we do! 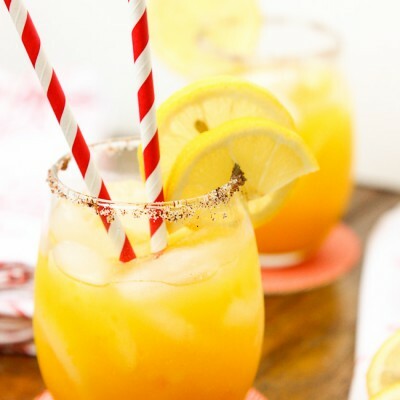 This look really tasty. 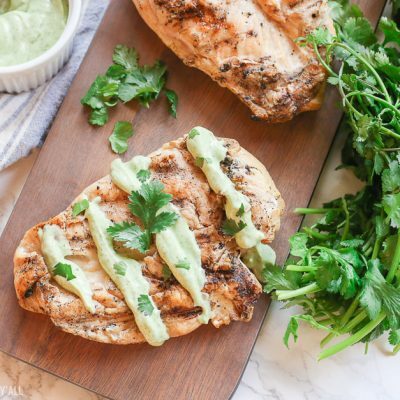 This recipe looks fantastic for those weeks where the bananas are too ripe to eat. I also had no idea cream cheese could be a potentially contain gluten or that they even made gluten free cream cheese. Thanks for stopping in Ron! Yes, I have heard of some cream cheese having issues with gluten contamination. 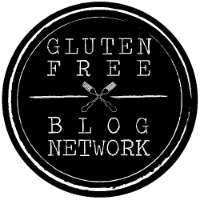 There are so many foods that you would NEVER think to have gluten that do in fact contain gluten. Oh and this batch is heavenly! It’s my mom’s favorite breakfast when she comes over to our house! 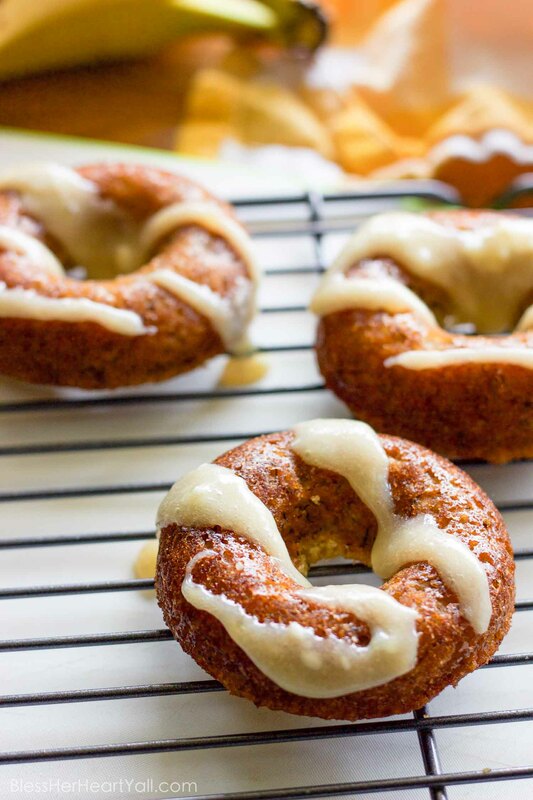 Banana bread in gluten-free donut form? OMG IM DROOLING! That honey ream cheese glaze is the perfect touch! Seriously these look AMAZING!! I have an obsession with donuts and am itching to use a new recipe for my donut pans! 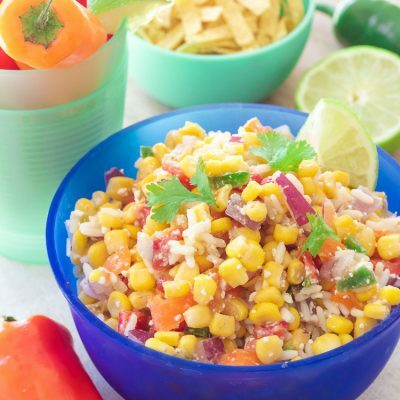 🙂 You share the best recipes!! Oh they are good girl! If you are looking to try a new donut recipe then you gotta try these!